I adore cinema and the art of film, so it’s a shame that so far this year I have only managed to go to the cinema twice. Especially with the run up to the Oscars and the incredible slate of films on release this awards season – from The Theory Of Everything to Birdman. It’s strange thinking that some of the films picking up nods this year were released nearly a year ago now, with it seeming only yesterday that I was in the cinema watching The Grand Budapest Hotel. It is this that makes the Alzheimer’s diagnosis all the more devastating. Alec Baldwin’s John does what any husband would and offers an alternative explanation when Alice first begins to worry about what is wrong with her, but as an audience we know what is to come. It is the reactions from her family that provide one of the main topics of debate from the film; as Kristen Stewart’s Lydia is keen to let Alice to deal with the illness in her own way while Kate Bosworth’s Anna seems to have a clear idea of what she thinks is the best approach. Alec Baldwin is arguably the family member with the biggest conundrum – does he keep working to maintain their financial situation or does he take the time out to make the most of the time they have? 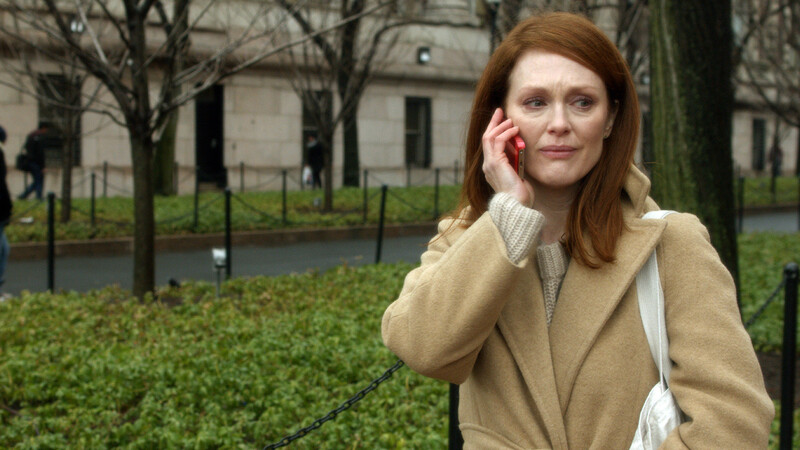 Still Alice is excellent at showing the full spectrum of reactions from those with a loved one diagnosed with such an illness. While different in what they think is the best thing to do, they are all united in their love and commitment to Alice. We bear witness to the good days and the bad days, and a range of emotions that allow some of the best acting performances you are likely to see for a long time. The supporting cast are fantastic, but it is Moore who gives the deepest (Oscar winning) performance. Alice’s speech at an Alzheimer’s summit, where she emotively highlights what it is actually like to suffer the disease but also her strong will to carry on brought me close to tears. Directing duo Richard Glatzer and Wash Westmoreland have created a stunning work of film, that uses clever cinematography to show us the world through the eyes of someone with Alzheimer’s disease – blurred backgrounds and fast moving camera shots give us a sense of the confusion and panic that Alice is going through. Time jumps between scenes later in the film give a glimpse of what it would be like to loose chunks of time due to memory loss. Glatzer’s own battle with ALS (a progressive neurodegenerative disease) informed the making of Still Alice, and he sadly passed away this month. His legacy is in this film which expertly depicts the anger, confusion and sadness that is experienced by millions each year; whether due to Alzheimer’s itself or through a loved one’s battle with it.